Welcome to the March edition of Soul-Sized Living Magazine! Apologies that things have been a bit quiet since November – I’ve been taking a semi-sabbatical, focusing on laying foundations and getting clarity about future plans, so some of my ‘doing’ had to go on hold for a while. And, as a result, I’ve got plenty of exciting news for this issue of Soul-Sized Living. This month we’re talking about gratitude, authenticity and even falling in love with life. 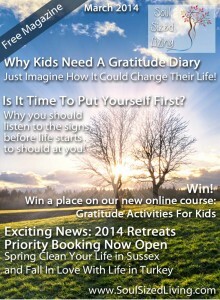 Plus there’s the usual “What’s on?” and news about our two key retreats for 2014. I hope you enjoy this edition. As always, I’d love to hear from you – either by replying to this email, or by commenting on articles and joining us on Facebook and on the forum. Isn’t It About Time… Download This Week’s Gratitude Screen Saver / Desktop / Wallpaper Image! Want to have some inspirational gratitude quotes as your screen saver and desktop background on your computer or phone? How about choosing to use it to help you focus on gratitude? And to stop you from getting bored (we all know how that stops us ‘seeing’ what’s in front of us ;-)), you can have a new one each week! Here’s where to download this week’s image: [Read more…] about Isn’t It About Time… Download This Week’s Gratitude Screen Saver / Desktop / Wallpaper Image! When You See The World Through The Eyes Of Gratitude: Download This Week’s Gratitude Screen Saver / Desktop / Wallpaper Image! Want to have something inspirational as your screen saver and desktop background on your computer or phone? Here’s where to download this week’s image: [Read more…] about When You See The World Through The Eyes Of Gratitude: Download This Week’s Gratitude Screen Saver / Desktop / Wallpaper Image! 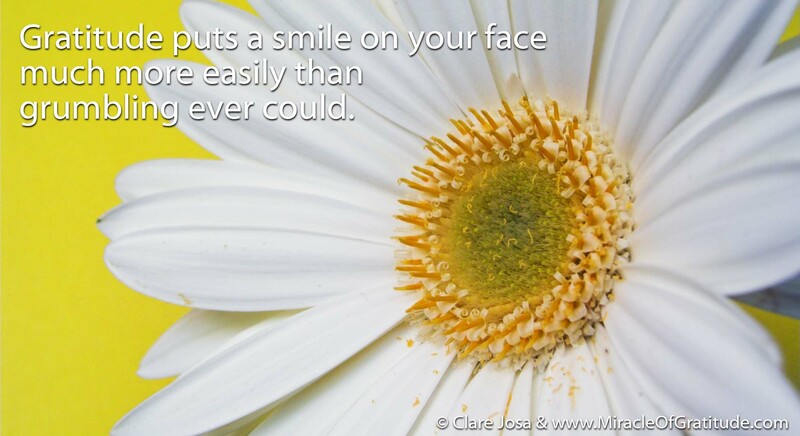 Putting A Smile On Your Face: Download This Week’s Gratitude Screen Saver / Desktop / Wallpaper Image! Here’s where to download this week’s image: [Read more…] about Putting A Smile On Your Face: Download This Week’s Gratitude Screen Saver / Desktop / Wallpaper Image! How To Re-Programme Your Thoughts: Download This Week’s Gratitude Screen Saver / Desktop / Wallpaper Image! Here’s where to download this week’s image: [Read more…] about How To Re-Programme Your Thoughts: Download This Week’s Gratitude Screen Saver / Desktop / Wallpaper Image! Is it time to move from living in your head, to living from your heart? Gratitude is the single, most effective way to shift from living in your Monkey Mind to living in your heart. How about trying it, right now? Imagine you are bringing your awareness from your head and firmly guiding it to sit in your heart. Let it settle here for a few moments, while you breathe in and out of your heart. Did you feel the shifts? Weaving gratitude into your daily life is perhaps the most potent thing you could do this year, to change your life (apart from chewing properly, but that’s another article :-)). So I’m inviting you – this World Gratitude Day – to finally take the step towards shifting your experience of life to move closer to the one you have been dreaming of. Gratitude is a way of experiencing life from the perspective of love, rather than fear. Here are 10 things you could do today, to spread a wave of gratitude around your world. How about using this year’s World Gratitude Day as an excuse to get started? Get Your Gratitude On Facebook! We run a Facebook page that’s all about gratitude – it’s called the Miracle Of Gratitude. 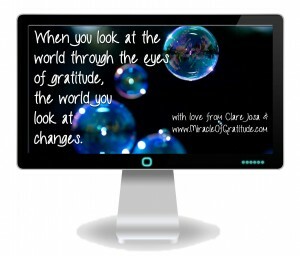 If you pop by and ‘like’ the page, then you’ll get daily gratitude goodies in your news feed – and you can also ‘join’ the World Gratitude Event, to connect with others who will also be celebrating this year. Did you know that you can get a weekly gratitude round-up – straight to your inbox, each Monday Morning, and it’s absolutely free? 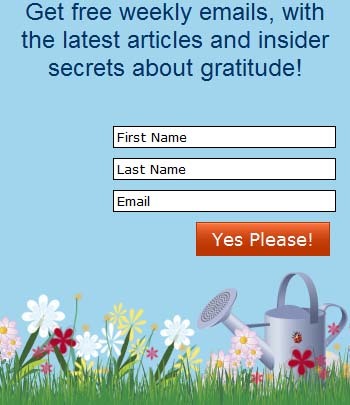 To start your week with the latest gratitude articles, insider secrets and resources, here’s where to register: Please send me weekly gratitude emails! This is the core technique for my gratitude journal and my gratitude kick start course – spending a minute or two really letting gratitude into your life. Here’s a link to a video to take you through it – if you enjoy it, please share it with your friends! 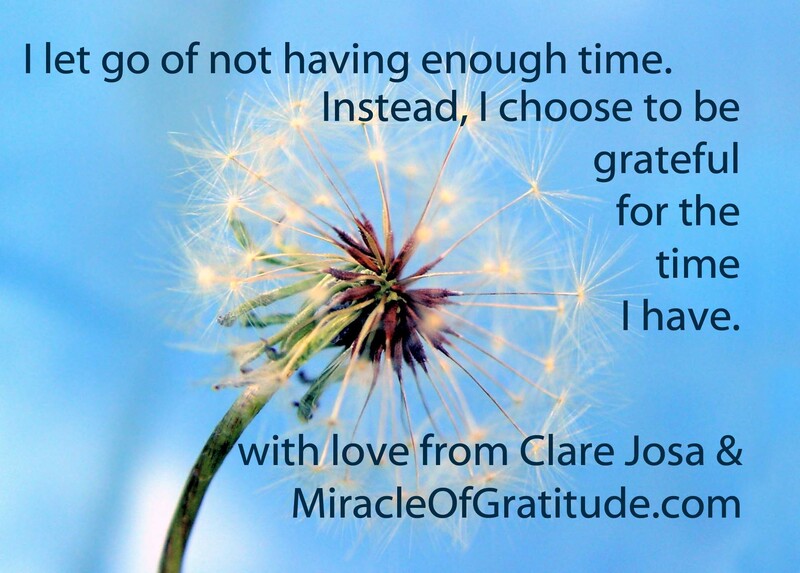 Change Your Life Now With Gratitude Minutes. We’re not talking cursory half-mumbled ‘thank yous’ here – we’re talking about proper, heart-felt gratitude. Who could you say ‘thank you’ to today? When did you last say ‘thank you’ to yourself? We tend to be about 100 times more likely to criticise ourselves than to acknowledge the good in who we are and what we do. 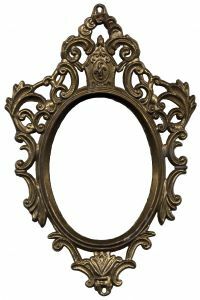 How about taking a moment to look in the mirror and say ‘thank you’ to yourself? Want to go for the max? Say ‘thank you’ for at least 3 things! Do one of your own – or there’s one that comes with my gratitude journal, for the readers’ club members. Remember the ‘olden days’ when it used to feel lovely to get a letter or a card? Somehow an email or text just doesn’t create the same heart-lifting feeling. There’s bound to be someone in your life today who would appreciate a ‘thank you’ note – it doesn’t have to be elaborate or on a beautiful notecard – simply grab a pen and some paper and write a note from your heart. It might just make their day. Start a journal! Choose a special notebook and write in it – each day – about things you feel grateful for. Psychology researchers have shown that doing this for as little as 3 weeks can have a measurable positive impact on your experience of life. If you want to take things to the next level and be inspired to really make gratitude part of your every-day life – easily – then Gratitude: A Daily Journal might be just what you’re looking for. And here are some articles to give you inspiration about how to do it, what to write and how to avoid the usual mistakes that can put people off! Gratitude journals: top tips and insider secrets. If you’d like to spend the next seven days making a fast-acting start to your gratitude habit, then you’ll enjoy my Gratitude Kick Start programme. To celebrate World Gratitude Day, I am waiving the usual donation for this course for everyone who signs up by September 22nd – it’s yours, as my gift. 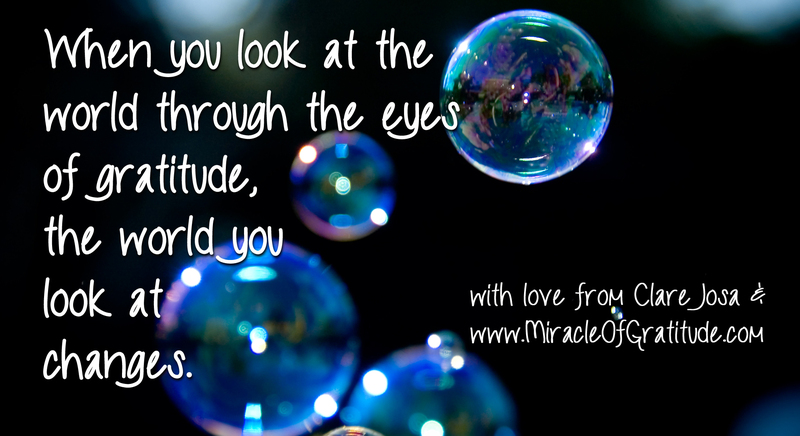 If your heart is calling you to really dive in deeply and make a commitment to gratitude becoming part of your experience of life, then you might want to join my Miracle Of Gratitude – Inner Circle group mentoring programme. I won’t go into details here – if it’s calling to you, you can find out how to apply at the above link. Which of these could you choose – right now – to help you take that first step on your journey? It doesn’t have to be a huge leap – but setting your intention to move towards living from your heart, with gratitude, will open the door for miracles to arrive in your life! 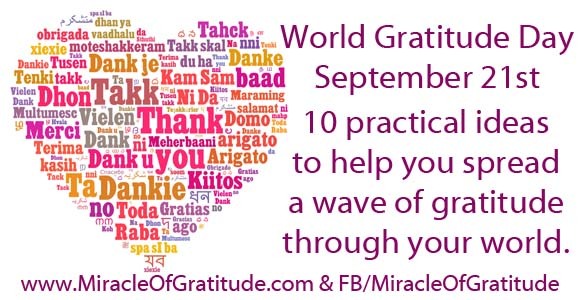 What are you going to do, to celebrate World Gratitude Day, this year? I’d love to hear from you, via the comments box!